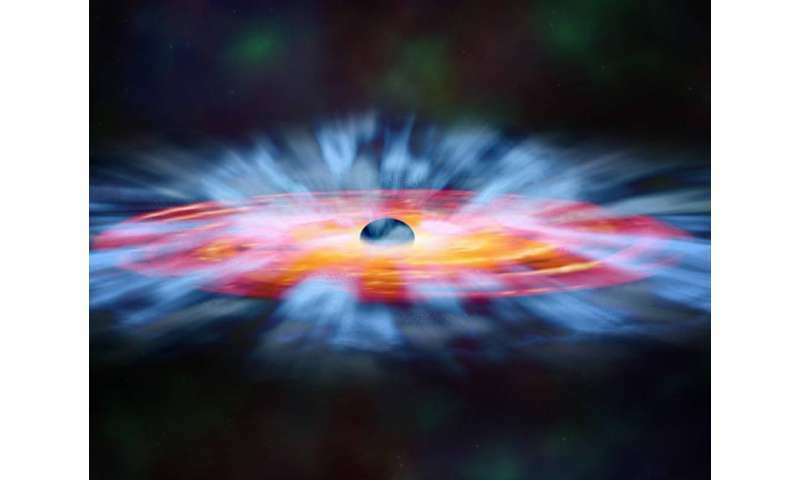 New research led by astrophysicists at York University has revealed the fastest winds ever seen at ultraviolet wavelengths near a supermassive black hole. More information: Jesse A. Rogerson et al. Multi-epoch observations of extremely high-velocity emergent broad absorption, Monthly Notices of the Royal Astronomical Society (2016). DOI: 10.1093/mnras/stv3010, http://arxiv.org/abs/1509.02842]. "We're talking wind speeds of 20 per cent the speed of light, which is more than 200 million kilometres an hour. That's equivalent to a category 77 hurricane,"
Accretion models??? Want to buy a bridge? "We not only confirmed this fastest-ever ultraviolet wind, but also discovered a new wind in the same quasar moving more slowly, at only 140 million kilometres an hour,"
At only.... Want to buy a bridge? In light of these types of winds obviously preventing an external source of growth, how can one take a merger maniac seriously? Consider the evolution of galaxies as growing from within, and note a natural progression in size correlating with core activity and wind speeds, etc. Why is this so hard for merger maniacs to see? They look but do not see. Interestingly, it seems that two factors militate against rapid star formation in galaxies: these quasar winds, and infalling hot hydrogen from the intergalactic medium. Makes one wonder how galaxies form in the first place. It's because of gravity, and forces of thermodynamics, no? When remembering how general relativity works, black holes dilate time to what would take the entire history of the universe for a single particle to enter its event horizon. Could it be possible that quasar winds are the Big Bang dilated (or at least all the energy projected holographically into 4+ dimensions)? What's this guy smoking? Extending the hurricane categories doesn't make sense, as the scale is neither linear nor logarithmic and the category 5 is supposed to be open-ended anyway. I was just commenting that given all the things that disrupt galaxy formation, it's interesting that we see lots of galaxies. Yes it certainly is. It makes a pale blue dot like Earth seem pretty special. But then again, that's the power of billions of years and billions of galactic centers to form around. We see lots of galaxies because reality cares not for astrophysicists feeble guesses as to how the Universe works. The problem is not the observations, but it's the hypotheses! And this goes for not only galaxies but also stars and planets. The whole of the accretion hypotheses is meaningless pseudoscientific mumbo jumbo. We see lots of galaxies because reality cares not for astrophysicists feeble guesses as to how the Universe works. Non sequitur much? We see lots of galaxies courtesy of the astronomers, astrophysicists, cosmologists, etc. who, with their hard work and dedication, keep improving and adding to our abilities to see things otherwise not visible to the unaided eye. At the interface of the disrupting mediums. Ahhh, a chaos argument. Not bad, Whyde. There's always an interface, a buffer zone whereby the two opposing "forces" mediate (balance) each others actions. The Universe is ALL about balance and action/reaction symmetry. There's another factor at work here, which is that star formation packs the dust and gas in the spots between the newborn stars together, yielding further star formation. One of the easiest places to see this is in the Eagle Nebula, in the Hubble shot named "Pillars of Creation." It's also interesting to contemplate the fact that the infalling hot hydrogen may be from nearby quasars, causing them to inhibit star formation two different ways. There's another article more recently published on here regarding the mechanism by which quasars suppress star formation titled "Quasars slowed star formation" that has some consilience with this one and is definitely worth a read. This "journalism" that accepts and assumes that nothing has any value or meaning unless it can be related to everyday human experience is really bankrupt and completely without integrity. You see it every day, but this has to get the prize this month for the very, very worst.